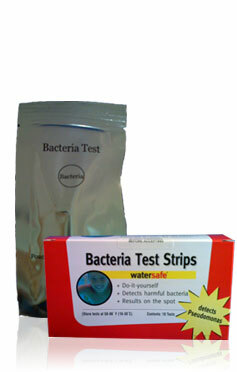 We offer the WaterSafe Bacteria Test Strips in a box of 10 or a single strip. The WatersafeÂ® Bacteria Test kit is a revolutionary test kit for bacterial contamination in water. It is based on proprietary immunochemical reagents and formats created by Silver Lake Research Corporation. The WatersafeÂ® Bacteria Test has all the accuracy and reliability of a lab test, but in a disposable test strip similar to a home pregnancy test. The combination of ease-of-use, speed, and reliability add up to an ideal screening and monitoring method for all types of water samples. Salmonella Lakes, ponds, streams etc.